Materials: Chromed metal (iron). Trihedral “trierdi” shaped crystal clear glass rods. Bakelite sockets. Electricity: 9 bulbs E27, 9 x 60 watt maximum, 110/220 volt. 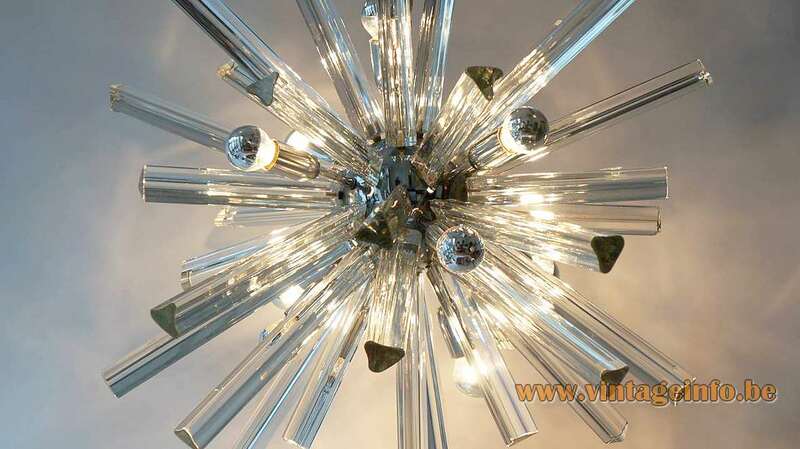 Any type of light bulb can be used, but a clear bulb or a silver cupped one is preferred. Trierdi is the Italian word for trihedral. 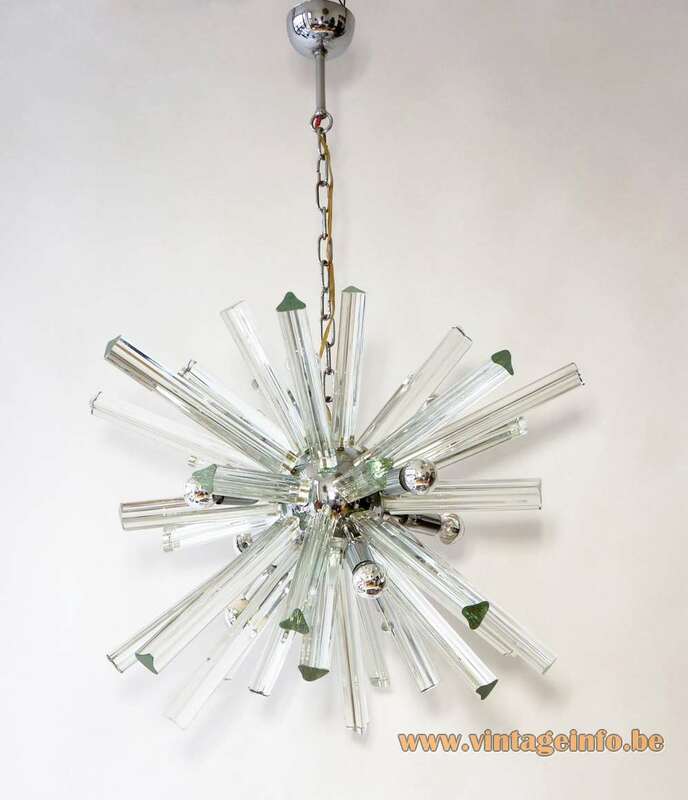 Often sold as a chandelier produced by Camer Glass. 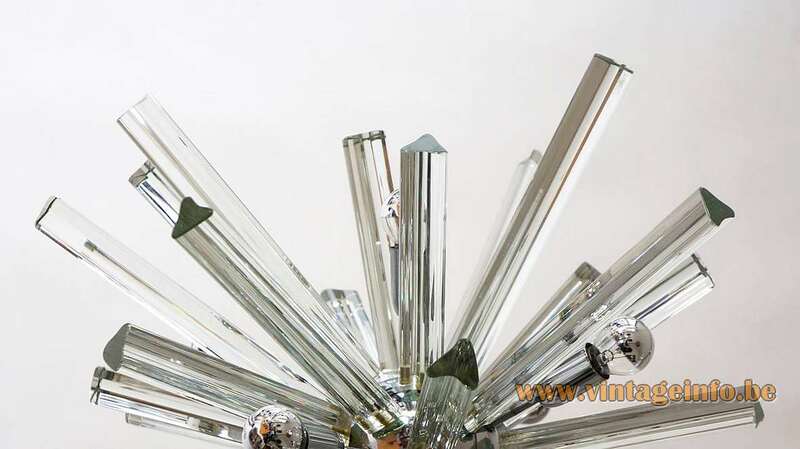 Camer Glass was an American importer of glass, located in New York and specialized in lighting fixtures that were primarily made in Murano, Italy, and the Czech Republic. Camer Glass no longer exists. The company was at least active in the 1960s and 1970s. 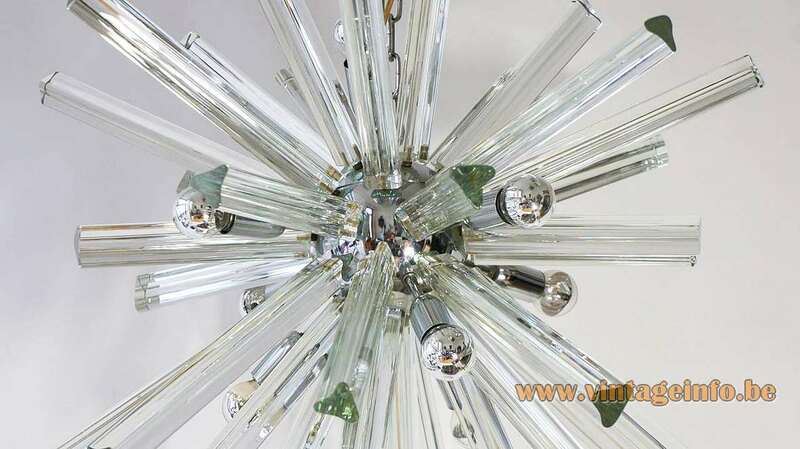 They sold glass produced by many famous companies such as Venini, Barbini and Seguso. The trierdi shaped crystal rods are a typical Venini design. Venini produced many lamps with this shape. 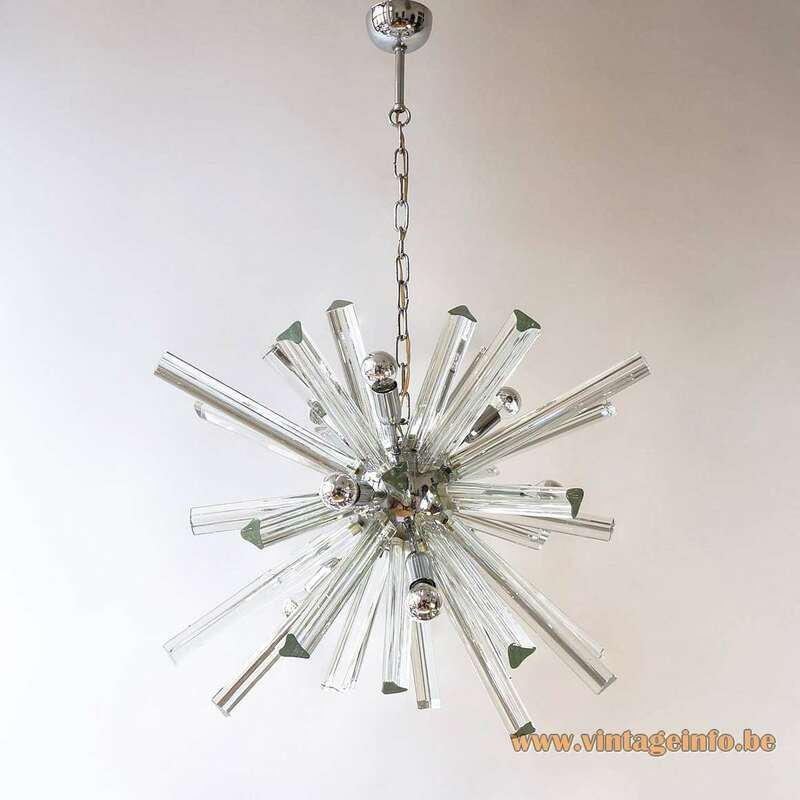 This chandelier dates from the 1970s, so it is possible that is was produced by them. However, several lamp producers made these type of lamps. Even today you can buy new ones. 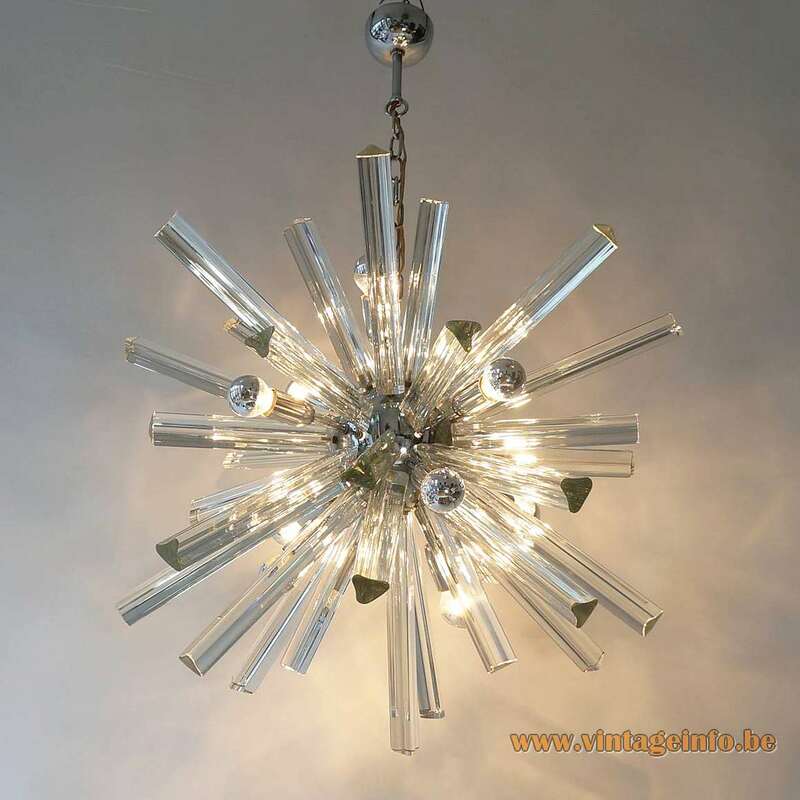 Giovanni Dalla Fina is a company that produces these Sputnik chandeliers today. Working from his youth in the Murano glass business, Giovanni opened his own company in the early 1970s. The company is specialized in the restoration of antique Murano chandeliers, and in the best production of his own particular models.